Why wait for dinner to have dessert. The showing season for Juliette and Lila has finally kicked into gear. School ends the first week of June and then they will be off to PA for the summer, riding every day and traveling to away shows for a week or two at a time. Lila, who rides in the small pony hunter division, qualified for the Devon Horse Show which was this past Memorial Day weekend. It's a year long process to qualify in her division and only the 30 top riders and ponies in the country are invited . We drove down on Thursday and she was competing on Friday and Saturday. The car ride was filled with talk about the lemon sticks, lemon candy canes stuck into lemons which are sold at the horse show fair and are the perfect pairing of sweet and sour, and of course the derby hunt teams.. The Derby Hunt Teams, where three riders compete as a team, with costumes and theme music and have to jump in sync are a traditional end to junior week at The Devon Horse Show. A time for the riders to take a deep breathe and have some fun. Friday morning started early with a 6 am schooling in the show ring and the first class starting at 8. The conformation class is a grueling 45-50 minute test of patience while the riders and ponies are being judged on how well they model. The ponies legs, head and ears all have to be in a certain position while being judged. Last year, Lila and IParty had a great model until Party decided she was hungry for a bow and took LIla's right out of her hair in front of the judge. Redemption was made this year with Lila and IParty jogging to a 9th place finish. She also jogged to another 9th place finish in the over fences class later that morning. Saturday started the same as the day before with some beautiful riding. A fourth place in the under saddle class and making the Classic cutoff by a half a point. The real excitement and what I believe drove her to ride so well all year, were the pony hunt teams. With all the formality and pressure of the show, the end of the day is a time for the junior riders to have some fun. From the moment we received the invitation to the show the preparation for the hunt teams began. Finding the other riders to join your team, choosing a theme and getting the costumes ready. Talk about pressure!!! Again, teams of three riders jump a course in costume and music. They follow each other over several jumps with the last two jumps side by side, three across, and have to be jumped together. The crowds around the ring are usually the largest of the day. The Ghostbusters were ready to roll when one of the riders scratched from the show that day. We scrambled to find another rider and only meeting her a few minutes before getting into costume. Juliette walked in the ring to hand the judges the traditional basket of bribes filled with wine, chocolate, the Ghostbusters dvd and some other goodies. The girls had a fantastic trip and took home third place. I was so proud of Lila and IParty for all the hard work and discipline that went in to the entire show. I could not think of a better way to celebrate the next morning than having dessert for breakfast. 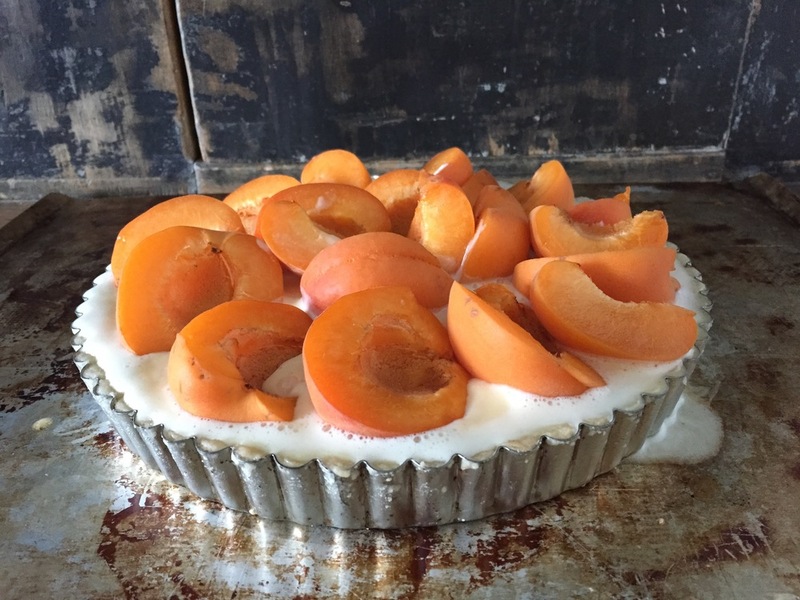 The Verlet apricot tart is perfection in its simplicity. Verlet is a tea shop in Paris and this recipe comes from the well worn pages of my copy of Patricia Wells "The Food Lovers Guide to Paris". It is easy, quick to make and remember to always use fresh apricots. "The Food Lovers Guide to Paris" is a comprehensive guide to all things food in Paris, mixed with wonderful recipes from some of Patricia Wells' favorite restaurants and shops. A must read for any one who is visiting Paris and likes food. Butter the bottom and sides of a 9-inch fluted tart pan with removable bottom. Set aside. Prepare the pastry: In a large bowl, combine the melted butter and the sugar, and using a wooden spoon, stir to blend. Add the remaining ingredients and stir to form a soft, cookie-like dough. Transfer the dough to the center of the buttered pan. Using the tips of your fingers, evenly press the pastry along the bottom and up the sides of the pan. The pastry will be quite thin. Place the pan in the center of the oven and bake until the dough is slightly puffy and set, 12 to 15 minutes. Sprinkle the ground almonds over the bottom of the crust, to prevent it from becoming soggy. Meanwhile, in a medium-size bowl, combine the crème fraiche (or heavy cream), egg, extracts and honey and whisk to blend. Whisk in the flour. Pour the filling evenly over the pastry. Starting just inside the edge of the pan, neatly overlap the halved apricots, cut side up, at an angle. Arrange in two or three concentric circles, working toward the center. Fill in the center with the remaining apricots. Place the tart pan on a baking sheet. Place the baking sheet in the center of the oven and bake until the filling is firm and the pastry is a deep, golden brown, 55 to 60 minutes. The apricots will shrivel slightly. Remove from the oven and immediately sprinkle with confectioners’ sugar. Place the tart on a rack to cool.